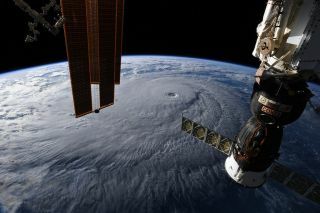 Hurricane Lane began threatening Hawaii on Aug. 22, when a NASA astronaut spotted the storm from the International Space Station. Hurricane Lane began pummeling Hawaii on Wednesday (Aug. 22), carrying with it strong winds and heavy rains, and space science has not escaped the storm's wrath. The hurricane has closed some of the most iconic telescopes in operation for two days and has delayed the launch of a mission meant to help NASA practice for visits to distant icy moons. In the statement, Lewis confirmed that the observatory remains closed because flooding is causing road problems throughout the island, adding that the facility itself hasn't seen any damage from the hurricane. And it turns out that even missions that skip the rocket launch remain vulnerable to the weather. That's what a team of astrobiologists, microbiologists and geologists is experiencing with Systematic Underwater Biogeochemical Science and Exploration Analog, or SUBSEA, an oceanographic mission that was due to set sail yesterday but that has been postponed on account of Hurricane Lane. When that mission does begin, it will explore the seafloor at Lo'ihi, the volcanic seamount off the coast of the Big Island that will one day become the next Hawaiian island. Scientists will use remotely operated vehicles to study microbes and geology at the site, which they hope will mirror the environments found deep below the ice of Jupiter's moon Europa and Saturn's moon Enceladus. Of course, there's no evidence of hurricanes on either moon — all the more reason to prioritize safety and wait for the storm to pass before setting off to explore the unknown.